, M. D. an eminent accoucheur, was a native of Scotland, and after some practice in his country, settled in the early part of the last century in London. 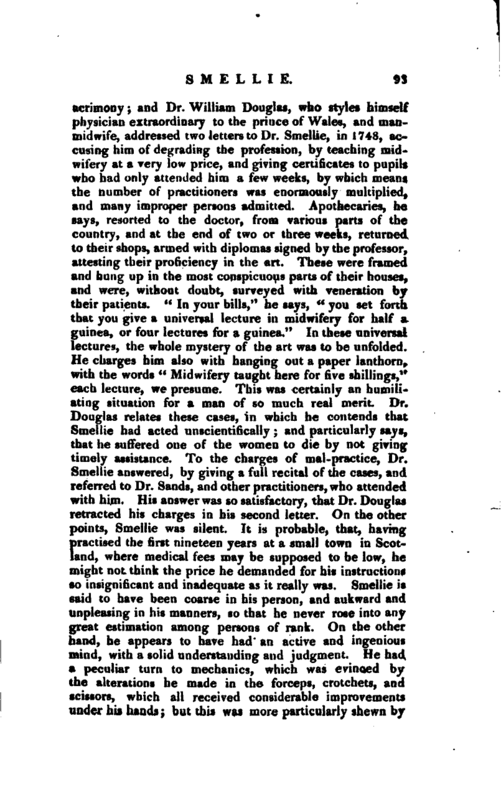 He was principally celebrated as a teacher, having instructed, as he informs us in his practice, nearly a thousand pupils, who assisted, whilst attending his lectures, eleven hundred and fifty poor women. The women were supported, by a subscription among the pupils, during their lying-in. 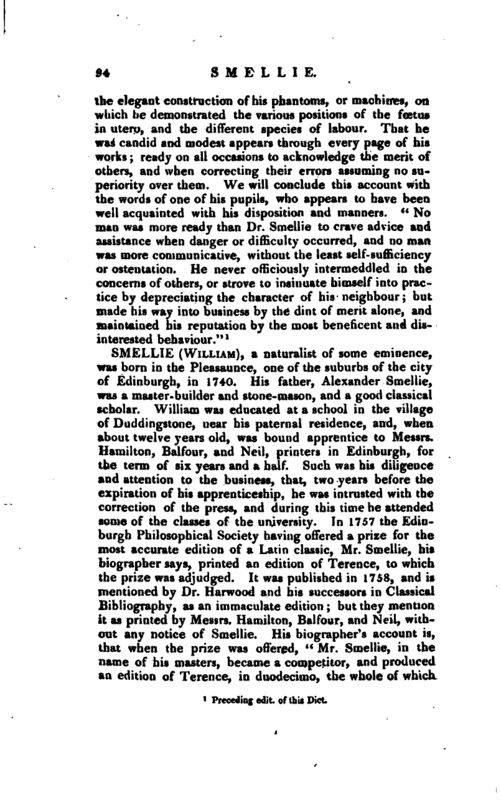 Dr. Smellie was the first writer who considered the shape and size of the female pelvis, as adapted to the head of the foetus, and who ascertained the position of the latter during the period of gestation; and his opinion has been confirmed by later writers, particularly by Dr. Hunter, who had several opportunities of dissecting women who died undelivered, at different periods of their pregnancy. 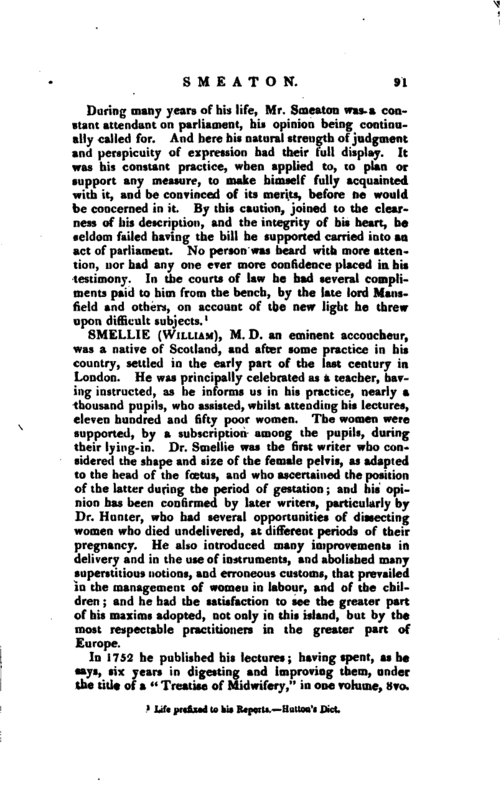 He also introduced many improvements in delivery and in the use of instruments, and abolished many superstitious notions, and erroneous customs, that prevailed in the management of women in labour, and of the children; and he had the satisfaction to see the greater part of his maxims adopted, not only in this island, but by the most respectable practitioners in the greater part of Europe. In 1752 he published his lectures; having spent, as he says, six years in digesting and improving them, under the title of a “Treatise of Midwifery,” in one volume, 8vo. | This was followed in 1754, by a volume of cases, intended to illustrate the method of practice recommended in the treatise. These were very soon translated into French by Mons. Preville, who assigns as a motive for the undertaking, the high character the author enjoyed on the continent. 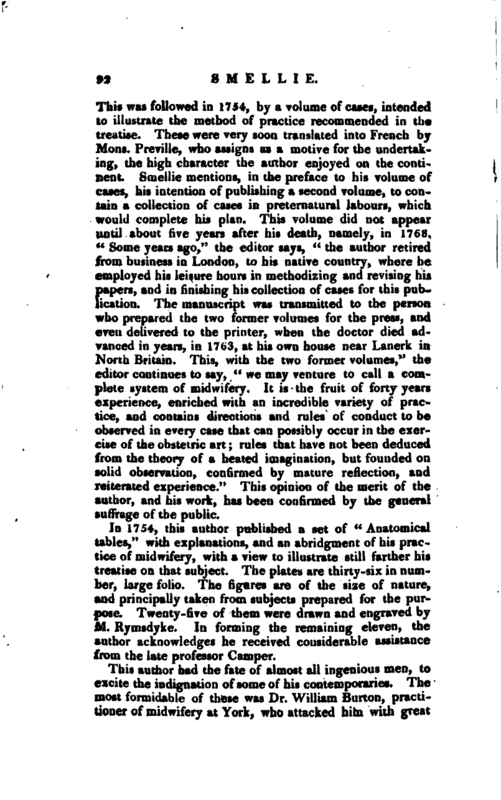 Smellie mentions, in the preface to his volume of cases, his intention of publishing a second volume, to contain a collection of cases in preternatural Jabours, which would complete his plan. This volume did not appear until about five years after his death, namely, in 17G8. “Some years ago,” the editor says, “the author retired from business in London, to his native country, where he employed his leisure hours in methodizing and revising his papers, and in finishing his collection of cases for this publication. The manuscript was transmitted to the person who prepared the two former volumes for the press, and even delivered to the printer, when the doctor died advanced in years, in 1763, at his own house near Lanerk in North Britain. This, with the two former volumes,” the editor continues to say, “we may venture to call a complete system of midwifery. It is the fruit of forty years experience, enriched with an incredible variety of practice, and contains directions and rules of conduct to be observed in every case that can possibly occur in the exercise of the obstetric art; rules that have not been deduced from the theory of a heated imagination, but founded on solid observation, confirmed by mature reflection, and reiterated experience.” This opinion of the merit of the author, and his work, has been confirmed by the general suffrage of the public. In 1754, this author published a set of “Anatomical tables,” with explanations, and an abridgment of his practice of midwifery, with a view to illustrate still farther his treatise on that subject. The plates are thirty-six in number, large folio. The figures are of the size of nature, and principally taken from subjects prepared for the purpose. Twenty-five of them were drawn and engraved by M. Rymsdyke. In forming the remaining eleven, the author acknowledges he received considerable assistance from the late professor Camper. 1 Preceding edit, of this Dict.